CHICAGO - When he walked off the field after the third inning yesterday, Clay Buchholz's stride was slow and deliberate. Nearing the dugout, he removed his Red Sox cap and wiped his forehead with his arm. It had been a long day so far, a long four-run inning, yet another bit of failure as Buchholz works feverishly to correct the problems that have led to a very long season. Nothing seems to go right for Buchholz these days, despite the tempered optimism he expressed after the game - even as his manager was being asked just how long this can continue. With Buchholz sinking to 0-6 with an 8.19 ERA in his last seven starts with a 6-5 loss to the White Sox yesterday at U.S. Cellular Field, the Red Sox trailing Tampa Bay for the division lead, and their wild-card lead narrowing, it seems the pitcher's place in the rotation might be a bit shaky. "We haven't talked about it," skipper Terry Francona said. "I mean, we have not talked about that. That's about as honest as I can be. I think more of our energy and thoughts [are] going into how do we get this kid pitching like we know he can on a consistent basis." Not long after the pregame news that Tim Wakefield was scratched from his start tomorrow and will be put on the disabled list, the Red Sox started off yesterday's game about as well as they could have hoped. Before Buchholz even took the mound, he was provided a lead for the second straight start. This one was three runs, courtesy of Mike Lowell's three-run homer just beyond the outstretched glove of Carlos Quentin in left field, Lowell's first home run in 27 games. But that lead didn't last long, and neither did Buchholz. There was the Jermaine Dye solo home run (off a two-seamer) in the second, then two two-run homers in the third, one by Quentin (two-seamer) and one by Jim Thome (curveball), giving Chicago a 5-3 lead. Buchholz, who has allowed eight homers in his last five games, departed after facing two batters in the fourth. He gave up seven hits and five earned runs, walking two and striking out four. "He's not being as efficient as he wants to," Lowell said. "I think his pace of game has to improve. I don't know if he's thinking too much. I'd kind of prefer him to just go up there and fire, because he's got good stuff. I don't know what it is. You root for him, you feel bad. Especially when you spot him a three-run lead before he takes the mound, you kind of want him to hold the fort down. "It sounds so simple, but it's not that easy." That seems clear, especially in watching Buchholz. Once he was dressed yesterday, he sat for a few beats, staring into his locker. He got up, missed while trying to kick a towel into a basket, and wandered off toward the back of the clubhouse. He seemed lost, in many ways, the same feeling he seems to exude on the mound at times. "Today's one of the few times this year, same story, but I felt like I actually made pitches today that got hit," Buchholz said. "Up here you expect them to hit mistakes, and when you don't make a mistake with a pitch and it still gets hit, it makes it that much harder to swallow, I guess. "Today was actually a confidence-booster. I went out and threw a lot of quality pitches that, like I said, got hit." Even with Buchholz's latest frustrating outing, the Red Sox narrowed Chicago's lead. And it would have been even closer, had a throw from Lowell to Jason Varitek in the fifth been just a bit higher. With Paul Konerko on third base, Juan Uribe hit a bouncer to Lowell, who was playing in on the grass. 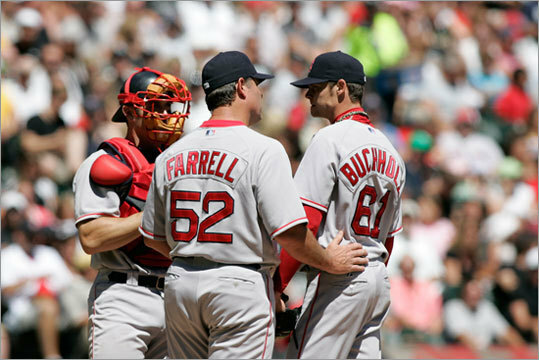 Barehanding the ball, Lowell threw home, and it bounced low and squirted out of Varitek's grasp. Error Lowell, and score another run for the White Sox, making it 6-3. "So-so. It's kind of do-or-die," Lowell said of his grip on the ball on the play. "I don't think anyone ever catches that with two fingers on the ball. You're kind of throwing with your whole hand. I definitely wish I would have made a better throw, [it] kind of short-hopped 'Tek." So what should have been a good day for Lowell, turned again. The Red Sox scored twice in the sixth to close to within a run at 6-5, and reliever Matt Thornton walked three straight Red Sox with one out in the seventh. He was replaced by Octavio Dotel, who induced Lowell into a double play. Six more outs, including three by Bobby Jenks for another save, and the Red Sox had lost the game, and another in the standings to the Rays. That leaves the Red Sox 4 1/2 games out of first place in the East as they near their biggest deficit of the season. With one starter down, and another one struggling badly, the other three (Josh Beckett, Jon Lester, and Daisuke Matsuzaka) will need to be even better than they have been all season. That, or Buchholz needs to find a way out of the darkness. "Seemed like every time there's a hit, or an error, it was followed up by pretty solid contact," Francona said. "I think the term probably used a few times is 'stopping the bleeding' or 'limiting the damage' . . . [that's] been the hardest thing. "I just think, and we keep saying, experience is going to be big for this kid. And right now he's experiencing just about everything."